Most of the people who know me would be surprised to know that I skipped on ‘C’ is for Cat or ‘K’ is for Kitty. I mean, the banner on this blog right now is a picture of my personal demon, Midnight, and I make no secret of being a cat person. But now we’ve reached ‘n’ and ‘N’ is for Neko. It is time. 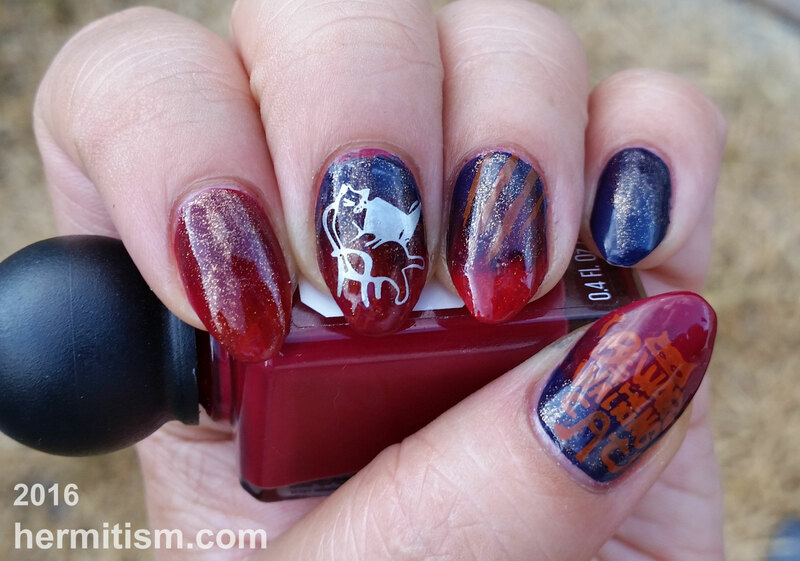 I did not like my first version of this manicure (see end of post). After debating whether or not I wanted to call it good and post my manicure on the first day or try again I resolved the dilemma by picking at it before I could take a picture. Yay? I ended up doing random gradients with the colors I had and layered the Orly polish on top for happy-making glitter. I thought the OPI color was coming out pretty opaque when I painted my nails, but it turns out it wasn’t quite opaque enough for stamping over dark colors. 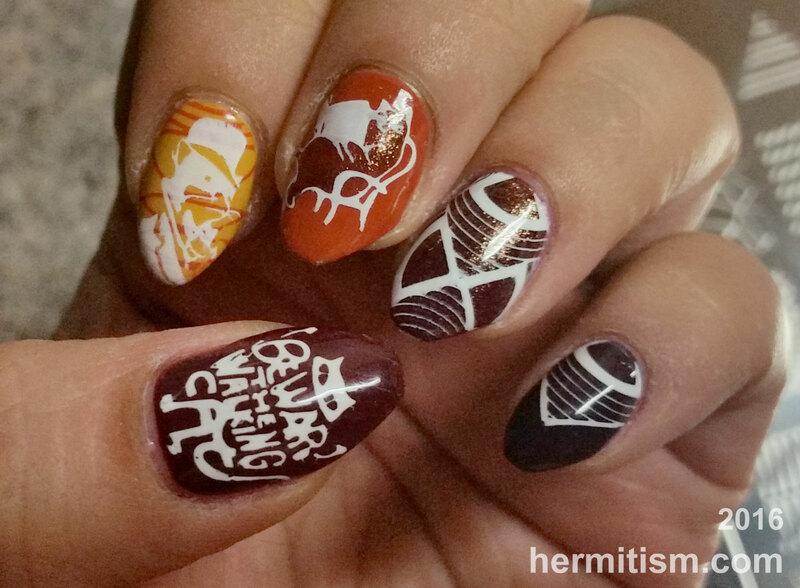 I really need to buy some good stamping polishes since I am so picky about the opacity of my stamps (not that playing with opacity isn’t fun, but I’d like it to be a choice instead of my only resort). One last stamp from the hēhē nail plate in silver and I felt like I could call it good enough. Someday I would like to revisit the “Beware the Walking Cats” stamp and make it more quirky and fun, but today is not the day. Ahhh, my hands look so dry because by the time I took the picture I knew it would be labeled as my terrible mistake and got lazy. I’ve always had dry hands and as I start to delve into the photos from the past year or so that will be increasingly evident. I didn’t understand why nail artists’ hands tended to look so over-moisturized until I started editing my photos and realized how dry even lotionated hands can look. I bought cuticle oil for the first time shortly afterward and now own a second bottle for my purse. Vain, vain me. 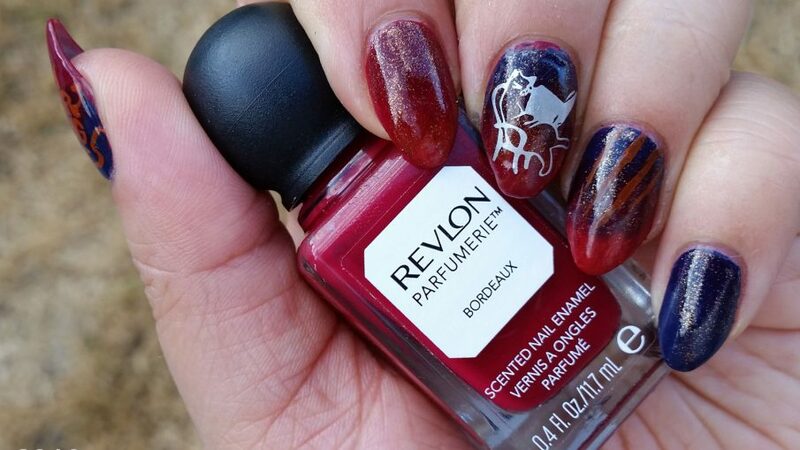 Love this manicure, especially how squishy the base layer looks! So cool! I love the rich colors and how they work together in the gradient!